This is an artist's conception of SIMP J013656.5+093347, or SIMP0136 for short, which the research team determined is a planetary like member of a 200-million-year-old group of stars called Carina-Near. Credit: NASA/JPL, slightly modified by Jonathan Gagné. 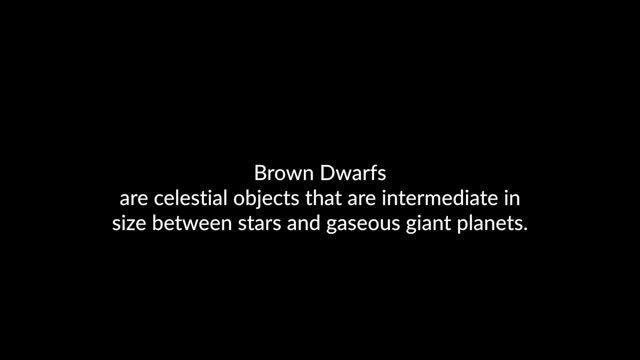 Sometimes a brown dwarf is actually a planet—or planet-like anyway. A team led by Carnegie's Jonathan Gagné, and including researchers from the Institute for Research on Exoplanets (iREx) at Université de Montréal, the American Museum of Natural History, and University of California San Diego, discovered that what astronomers had previously thought was one of the closest brown dwarfs to our own Sun is in fact a planetary mass object. 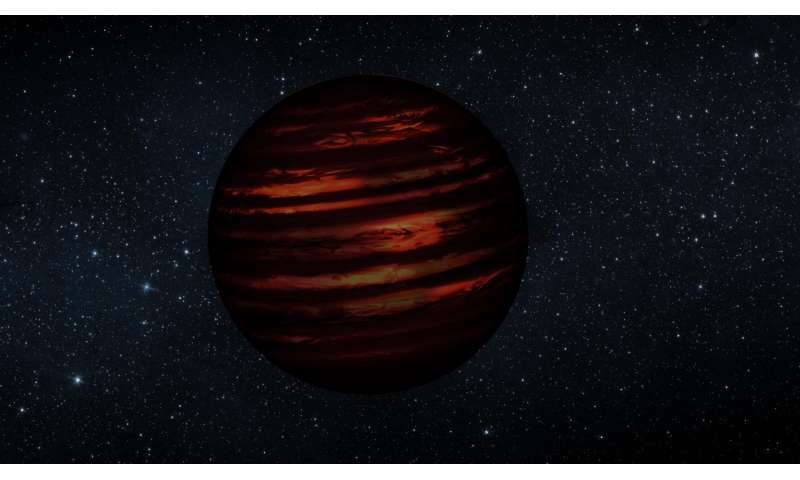 "This means that the temperatures of brown dwarfs can range from as hot as stars to as cool as planets, depending on how old they are," said the AMNH's Jackie Faherty, a co-author on this discovery. Gagné and the research team were able to demonstrate that at about 13 times the mass of Jupiter, SIMP0136 is right at the boundary that separates brown dwarf-like properties, primarily the short-lived burning of deuterium in the object's core, from planet-like properties. Free-floating planetary mass objects are valuable because they are very similar to gas giant exoplanets that orbit around stars, like our own Solar System's Jupiter or Saturn, but it is comparatively much easier to study their atmospheres. Observing the atmospheres of exoplanets found within distant star systems is challenging, because dim light emitted by those orbiting exoplanets is overwhelmed by the brightness of their host stars, which blinds the instruments that astronomers use to characterize an exoplanet's atmospheres. "The implication that the well-known SIMP0136 is actually more planet-like than we previously thought will help us to better understand the atmospheres of giant planets and how they evolve," Gagné said. Étienne Artigau, co-author and leader of the original SIMP0136 discovery, added: "This newest addition to the very select club of free-floating planetary like objects is particularly remarkable, because we had already detected fast-evolving weather patterns on the surface of SIMP0136, back when we thought it was a brown dwarf." Jupiter is a very small, but growing brown dwarf, emitting more heat than models predict. No citation is necessary. That's patently false. Jupiter is NOT a brown dwarf. It's mass falls far short of even the smallest brown dwarf. While it occasionally gathers up solar system debris from time to time, It's "growing time" ended billions of years ago. In fact practically all solar system bodies occasionally relatively speaking collect solar system debris and add it to their own mass, but like Jupiter their growing years ended about 5 Billion years ago. If the comment was not facetious, then believing that would mean the person has absolutely no idea what he is talking about. As for generating more warmth than it gets from the sun, that's due to contraction, and nothing to do with deuterium burning as in the smallest brown dwarfs. Insight into evidence in the database, we see that the authors of the article live in the distant past. Statistics speak alone for themselves. In my opinion hypothesis of star forming process by nebular contraction is doubtful, how the weakest force would be able of contracting gas/dust against so low pressure? Any experimental conformation of this concept? There is one known other process of matter contraction - plasma pinch; and while most of matter in universe is in plasma state this mechanism should be considered. This hypothesis is more consistent with observation, most star forming regions exhibit filamental structure [like beads on the string]. Also structures like 'accretion disks' are part of plasma behavior [Birkeland's terrella, Peratt instability]. Acc electric concept star is an object acting like anode in a plasma discharge, brightness is determined by energy density discharged on electrode. And this concept is more consistent with claims our ancient ancestors that Saturn was once a star [Sun]; most probably brown dwarf. In my opinion hypothesis of star forming process by nebular contraction is doubtful, how the weakest force would be able of contracting gas/dust against so low pressure? The simple answer to you comment is that gravity is not weak when masses are large. Ok, but why so few people consider much more efficient process of plasma pinch especially while this mechanism is testable in lab, most of matter is in plasma state and Herschel revealed filamental structure of star forming region? 1) Magnetic fields of the structure and strength needed to cause collapse do not occur naturally on astrophysical scales. The 'brown dwarf' planet in our own solar system, sometimes called planet Nine, is only half Jupiter mass, 141 +/- 35 earth masses. We called it Vulcan back in 2002 when we found it. Notice that its orbital inclination is 48.44 degrees, matching one of the two possible values postulated by U of Az astronomers. how the weakest force would be able of contracting gas/dust against so low pressure? Any experimental conformation of this concept? That's EU propaganda. First claim: 99% of everything is plasma. Approximately true, but what is counted as plasma, especially in star forming regions, includes gas where only a very tiny fraction of the atoms/molecules are ionized. Second claim: gravity is the weakest force. As proof the armchair physicists always compare the electric force between two charged particles vs. the gravitational force between them. But consider two neutral hydrogen atoms instead. Quantum theory suggests that the electron (at the lowest energy level) is smeared around the proton in a completely spherically symmetrical manner - there's not even an electrical dipole moment. The two charges completely cancel out. Thus the electrical force between two widely-separated hydrogen atoms is zero, and gravity is infinitely stronger than the electrical force. So when someone makes the "gravity is the weakest force" argument, the proper response is "How can you ignore charge screening?" the photons having actual spin, then the magnetic field detected would indicate an imbalance between photons and anti photons. Perhaps what caused the collapse of the spherical dwarf into a cloud?